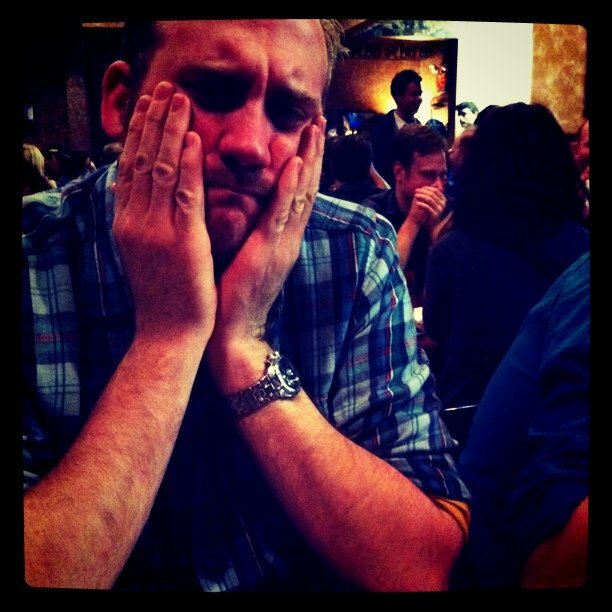 This is my face after sitting through yet another Nic Cage film…normally I’m a happy guy. Well hello there and welcome to my blog! This has been a long time coming and I finally listened to the masses (read: my friends) who have told me that I should start to bring my movie reviews and thoughts on film to the World Wide Web. Yes, I know I’m using a dated reference but it’s my blog and I’ll do what I want. In fact…I’m going to interview myself right now to see how I feel about this new endeavor. Joe the Interviewer (JI): Hi Joe, thanks for taking the time to sit down and talk to me today. Joe the Respondent (JR): No problem, I kinda had no choice. JR: No, no…it’s not that. I just know you are trying to put together an introduction in a clever way without resorting to writing a boring paragraph long biography. JI: See, I knew we were on the same page. JI: Great. So can you tell us (in about a paragraph) more about yourself? JR: No worries…how about we just say that I’m a 30-ish guy from MN that has had a love of movies since his first memories of being brought to his local theater (The Riverview…check it out!). Once my parents started renting a VHS player (yes…originally VHS players were so expensive that you had to rent them) and I found out I could bring some of this movies home…well…that was it. I’ve never looked back and aside from writing movie reviews for my mom’s work, doing personal reviews on Flixster, and responding anonymously to movie review websites I’ve never had a blog with which to share my thoughts on film. JI: See, that wasn’t that long. OK…next question. Why not just continue doing what you were doing and putting your thoughts on Flixster? JR: Well, I usually did that through Facebook when I temporarily stepped away from Facebook I realized that I missed writing my thoughts on movies, posting new trailers, and basically commenting on film in general. JI: How big do you intend this blog to be? JR: I’m actually working on making this a .com in a few months so I’ll be able to make the site more user-friendly and give my readers the power to explore on here a bit more. JI: What is going to make your blog different than other review sites/blogs? JR: I’m not necessarily going for different…I’d just like to have a place where I can tell people to visit when they ask me questions about movies or want to know about something I’ve seen. JI: What are your reviews going to be like? JR: I’ll tell you what they won’t be. I’m not going to write the entire plot synopsis out for you and then give my opinion in the last paragraph. I think my readers will be able to figure some of that stuff out on their own and I want to get to what you came here for! I’m going to start each review with a quick blast of information…the kind of information I like to see in reviews: Short outline, Stars, Director, Running Time. After that, we’ll get to the meat of the review. Sometimes the reviews will be long and sometimes they’ll be short. It all depends on my take on the film and what I want to say. JI: Perfect…and are you just going to be reviewing new movies in theaters? JI: Good…I know that people are going to want to read your review of Grease 2. JI: ….Great….are you sure that’s a good idea? I mean, you want people to trust your opinion. JR: I’m not worried…I like a wide variety of movies. Some are “good” bad, some are just bad. I’m not going to discriminate and I want to hear what people think about these reviews. So I hope people comment on my reviews and let me know what they thought. JI: So you want people to feel like they have a voice on your blog too? JR: Yes! I love talking movies with people! I’d rather disagree with someone and get a great discussion going. JI: Anything else you want to tell the readers? JR: Keep your eyes open for other special entries like a poll where you can tell me what movie to see next. I’m calling these entries “Why Haven’t You Seen this Movie?” For all the movies that I’ve seen there are some (embarrassing) gaps in my movie going life. I’m going to rely on the reader to direct me what to watch next. JI: Oooo…that’s giving away a lot of power. JI: Well I think that about covers it. JR: Yeah, it covers it. JI: Oh, so you were just being difficult? JR: Ah there is the famous Joe Botten Sigh. JR: Thanks for the interview. JI: No problem, though I’m not sure how healthy it is to talk to you like this. JR: I’m not really talking to you…I’m typing to you and I’ve thought about this discussion already…so I knew what I was getting myself into. JI: Well…good luck with everything. JR: Thank you. And thanks to all of you for reading this…onward! JI was a little harsh. I admire JR’s calmness. Hey Joe- I read a few of your movie reviews and I like how you do not disclose the entire plot. I like to read movie reviews, but if I decide to go see the moive, I’d rather not know what is going to happen. Although with the current state of Hollywood movies, re-make after re-make or boring been there done that Hollywood plot lines, for the most part I know how it ends anyway so why bother seeing it. I’m disappointed in your review of “The Dark Knight Rises” clip. That’s about the only movie I’m interested in seeing this year… I hope it’s better than you anticipate, but it sounds like it might not be…. Thanks for visiting. I think The Dark Knight Rises will be, of course, excellent. Christopher Nolan always impresses…and maybe I’m just not wanting the series to end! Okay. Good. From the tone of your review I thought maybe it left A LOT to be desired and perhaps it did. Often teaser trailers or clips are unimpressive. I just remembered that there actually is another movie that I want to see this year: “The Flowers of War” – another Christian Bale movie (I’m a huge fan). I believe that it came out the week of x-mas, but I do not think it is showing at any theaters in MN. It may be released in CA and NY only. Have you heard any news on it? In regards to the forlorn look you wear (J.I. or J.R.? ); someone needs to tell Cage that actors can turn down roles. Drive Angry? Hint: your first clue about a solid script may actually be the title. It sounds like something written by a tailgater. Pass this along to Cage, will you, Jim? Thanks! I really like this interview. It’s a lot more interesting then the other ‘About Me’ I have read. Greetings, Joe! I’ve just nominated you for a Versatile Blogger Award, because I genuinely enjoy reading your posts.